"It kind of broke my heart when I saw it. I still can't get it out of my head because it wasn't in a movie. It was real life". Like every morning starts, a cup of coffee in hand, the Today Show on, and scrolling through my Facebook feed, I found a gem that had occurred the night before. Myself, among many people, where watching the Golden Globes last night as stars were awarded for their exceptional work on the screen, in American television and film. I did not make it through the entire evening this time, but when I woke up I sure didn't miss a beat. 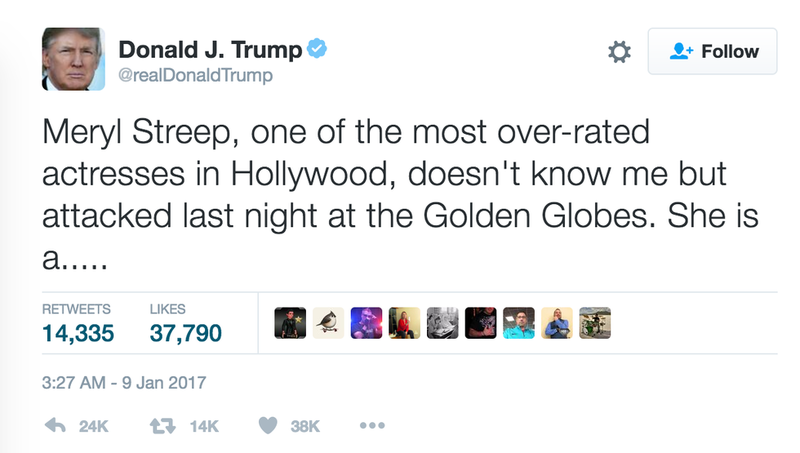 La La Land won seven Globes, which was not the biggest surprise, but rather Meryl Streep's acceptance speech for her Cecil B. DeMille Award for lifetime achievement. Earlier in the night I had made a remark on how incredible of an actress she was, and one of my favorites at that, so many of my favorite films include her. Last night, was just another reason she gave me to idolize her. You must be living under a rock if you haven't heard of the news yet; every outlet has covered it with a different angle in each. Just this in itself is representative of her speech. Meryl Streep covered current issues in her speech by simply starting with three words, Hollywood Foreign Press. In each of these words resonated a theme in her speech. She highlighted the culture and ethnicities that belong not only in Hollywood, but in our country. From this she highlighted the importance of these people and the place they have in our country, which all could call home. With each sentence furthering her speech along, came another comment on the actions of the new President elect, Donald Trump. It is no secret that this election was an upset to say the least. People have not given up though after the outcome, they keep expressing their thoughts and have not stopped fighting. Meryl Streep's speech last night may have been one of the most elegantly phrased actions against this election outcome yet. There was no hate thrown with her words, only truth. She expressed her self in such a way that there was no way you couldn't be moved. If you have not viewed the speech yet, it is a must see. Whether you support or do not support the President elect, Meryl Streep highlighted the importance of this new era upon the country. The person who will now be representing our country has shown actions that are not acceptable, but which many will now think are, due to the power he holds. 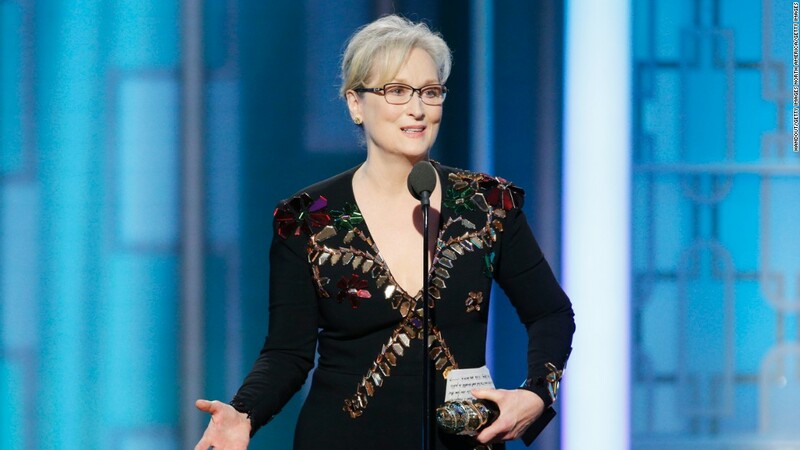 One of Meryl's most powerful instances in the speech is when she does not directly quote, but discusses the moment when Donald Trump mimics and mocks a disabled reporter, "It was that moment, when the person asking to sit in the most respected seat in our country imitated a disabled reporter. Someone he outranked in privilege, power and the capacity to fight back. It kind of broke my heart when I saw it. I still can't get it out of my head because it wasn't in a movie. It was real life". Meryl Streep took a leap of faith with this speech, and it hit home with a multitude of people. Not only did she illustrate such a portrait, but the reaction to it in itself just added another stroke. Donald Trump's reaction was not one that was a surprise, taking his business and plastering it on the social media website, Twitter. There is so much more to say and do as our country transitions into a time of uncertainty. Meryl Streep is one who has not given up, elegantly expressing her feelings unlike some others have done. What Meryl couldn't have predicted is that her illustration would only be furthered by the man she was painting himself. This speech was only one of the highlights of the Golden Globes, but one that is worth taking the time to look at. It's rare these days that you stop in your tracks to watch or read something on Facebook as you scroll through your feed, and when you do, you know that it is big.